The brand Manolo León started in Matalascañas, a seaside resort which belongs to the town of Almonte (Huelva) , in the year 1986. In that year, Manolo León opened a bar, the unfotgettable Bar Manolo León. His old friends Miguel Ángel and Manolo Vázquez helped him in his beginnings. It was not until the year 1994, when he made up his mind and start in El Porvevir district, in Seville, a new gastronomy concept based on a very good service on barrels and “everything to share” at tables. 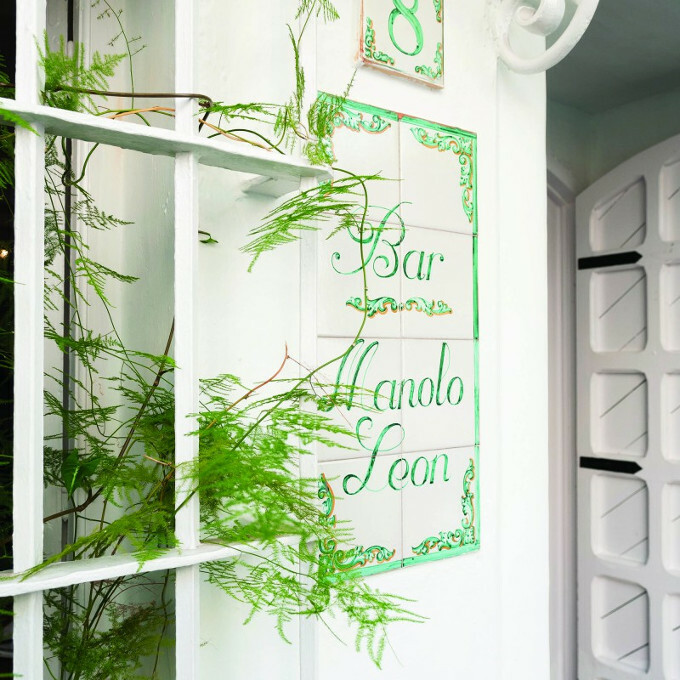 The name of the place couldn’t be any other than Bar Manolo León, located at 8 Juan Pablos St.
Bar Manolo León has a bright regionalist deco. An extensive menu and a varied choice of Tapas and Tentempiés. Bar Manolo León atmosphere is familiar and informal, there three different dining spaces plus an area of high tables at the entrance. The place is harmonious, 4 rooms decorated with different themes. .
A patio with a very well-kept and lush vegetation, and a pergola terrace on the top floor. To these six spaces the skylight area is added at the entrance hall. Casa Manolo León, for 15 years, has been a meeting place for friends and professionals, the ideal place to hold a family reunion. If you are interested in booking a table for a group, we have a personalized menu for Juan Pablos and Guadalquivir. Ask us. Manolo León imposed in this place the concept of “everything to share”. A multifunctional space, distributed in 3 rooms, where the client can find a bright and fresh decoration, gypsies and lebrillos, indirect light and colorful tablecloths.